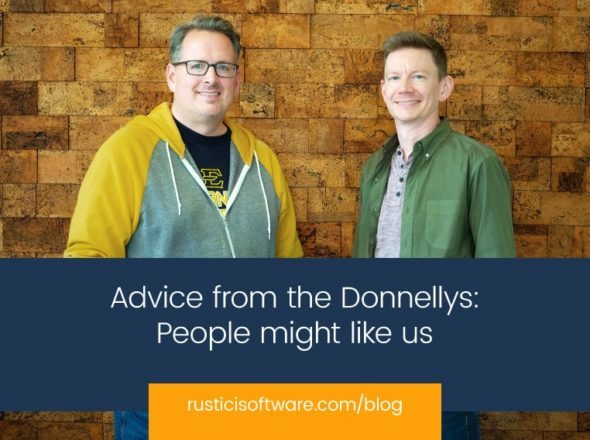 The Rustici Software internship is more than just a summer job. Our weeks aren’t just days filled with boring busywork. From Monday to Friday we are doing work that counts, as well gaining more knowledge everyday. From the moment we step in the office in the mornings, we immediately start learning. Some days it’s sitting in on a meeting or business call, while other days we have scheduled time blocked for “Lunch and Learns” or “Book Club”. It might be a little different from the typical summer internship, but it’s what makes interning at Rustici engaging and unique. It’s a way for the interns to learn more about the company, life after school, and to pick the brains of the Rustici employees. Every Tuesday we have an hour set aside to eat lunch with two or three employees. It’s mostly the interns learning about the different positions in the company and what everyone does. The free lunch in this arrangement is a definite bonus of Lunch and Learns. But the more interesting part of these lunches are the discussions we have with the people who work at Rustici. Everyone is always very open, they willingly give us advice about life after college and the chance to discuss questions we have. Another unique learning opportunity at Rustici is Book Club. All the interns and a couple of employees meet on Wednesdays, an hour before lunch. Over the 14 week program, the interns are reading two books, The Pragmatic Programmer and The Mythical Man-Month. These books bring our attention to the less technical side of being a developer, and have us focusing more on the ideas behind project management, working as a team, and time management. Book Club gives us a chance to discuss the content with peers and view the different takes and ideas. We get the chance to learn from people who have been at this for awhile and have experience in this field. Instead of reading for homework as a grade, we read as a group to exchange ideas and discuss how developing code has changed over the years. There are different mediums and ways to learn, it doesn’t stop and it never will. At Rustici we aren’t just interns cast in a corner, we’re seen as the next generation to be imparted with knowledge to help us grow and inform others. Every week we come away knowing more than we did the week before. We are being given tools that we can carry into the rest of our education, jobs, and lives. We’re learning through what we create, what we read, and interactions from the people here. We may be out of school for the summer, but we’re definitely still keeping our minds sharp, and learning a lot at Rustici.